RCN Wales is backing proposals to help carers gain health and social care qualifications or even train to be nurses. An estimated 6.5 million people are carers. The proposals would see nursing students gain experience on community placements, while carers' time would be freed up for training. RCN Wales director Tina Donnelly said the idea could could lead to better continuity of care and reduce isolation for those who dedicate their lives to caring. The scheme would involve second and third year nursing students being placed with carers and their relative or client, to gain experience of complex care needs in the community and free up time for the carers to do training. Speaking exclusively on Nursing Standard podcast Ms Donnelly said the idea had come from a discussion on the demands placed on carers with Swansea Carers Centre, a specialist voluntary organisation providing support to carers and former carers across the city and county of West Glamorgan. She said: ‘In some instances if the patient or next of kin passes on, the carer has given all their time and life to that care. They feel devastated for the loss, but they have also had no career aspirations, have not held down a job and tend to be quite isolated. Ms Donnelly said it was a ‘win win’ as improving and recognising skills would boost confidence, ability to care for their loved one and offer future opportunities. RCN Wales has proposed a pilot of eight carers using a model based on the story of a mother who was given support to get a caring qualification and later trained as a nurse. ‘We had a young mother with a disabled child. Her husband was in the forces, so she was often left alone to care and had to refer quite often to secondary care for support,’ explained Ms Donnelly. After gaining the qualification, the mother was supported by her parents to attend an access course to nursing. Ms Donnelly hopes the scheme will also cut down on the number of different people involved in care. One carer Ms Donnelly met with said she’d had 16 different healthcare professionals go into her home to provide support. This, Ms Donnelly said, could be reduced if the carer was better trained and a nursing student was assigned. RCN Wales hopes the scheme will provide students with experience in the community and promote working in fields other than just acute care. During episode six of Nursing Standard podcast, Ms Donnelly calls for healthcare support workers to be regulated and tells of her experiences in the Army Reserves as an intensive care nurse. 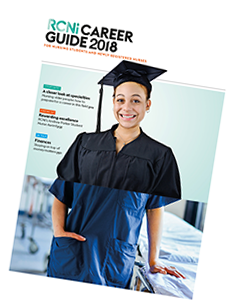 Also featured in this week's episode, Nursing Management editor Nick Lipley rounds off the show with a first-look glance at the brand new RCNi Careers Guide, available free to all final year students and newly-registered nurses with RCN Bulletin.